The Sala Mendoza recently presented the exhibition Caracas Suite, by Alexander Apóstol, a Venezuelas artist currently living and working in Spain. In this, his second individual exhibition at the Sala Mendoza, Apóstol presents a selection of works which bring together the most representative results of the investigation he has been carrying out over the past four years. 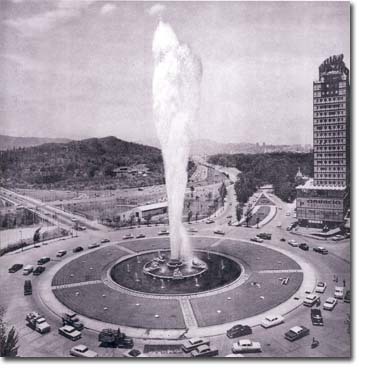 By means of a group of large format photographs and a video sequence, Alexander Apóstol took over the photographic documentary and introduced images of the architectonic symbols of Caracas at the end of the fifties, including public monuments, architectonic constructions and urban planning which, at that time, represented the icons of modernity in process within the Latin America context. These were the years in which Venezuela received the post-war migratory movement from Europe, and began to experience the economic boom which would explode in future years. In the political context, it falls within the end of the military dictatorship in charge of generating a grandiloquent image which today, half a century later, has become a repertoire of rubble and remains standing in testimony to the extinction of modernity and its encompassing speeches. The Caracas Suite showcase, with Ruth Auerbach as curator, consists of three photographic series: Residente Pulido, first presented at the Utópolis, La Ciudad 2001, exhibition in Caracas, and at the 25th Sao Paulo Biennial; Residente Pulido. Ranchos, which documents and examines the dwellings and constructions typical of the informal settlements and belts of urban misery which, in conjunction with being a product of the massive migrations, linked themselves to the metaphor of an economic model which failed and of a culture built on uncertainty; and Fontaintanebleau, a photographic selection of sources representing modern Caracas, the images of which are altered as a mechanism emphasizing -ironically- the splendor, not only of the original finish and makeup, but also the driving force and economic thrust of the years in which they were built. Caracas Suite also presents a series of large scale videos, the images of which take the most impressive symbols of urban architectonic projects in Venezuela during the fifties decade -including El Helicoide, El 23 de Enero, Las Torres del Centro Simón Bolí­var and El Silencio- placing these on view for visual mutiliation as an abstract of what they represent: great projects which either never managed to come together in their original functions, as in the case of El Helicoide - which in 1970 began to be thought of as a museum and is, today, the site of the dungeons of the Political Police -or have possibly become deformed and distorted, represented characteristically by the 23 de Enero, a group of buildings located to the West of Caracas, built during the military regime of Marcos Pérez Jiménez as a political housing strategy which, years later, became a species of ghetto for the insurgent urban guerrilla. Today they represent not only one of many dilapidated structures, but a complex network of social relationships abiding by its own rules.